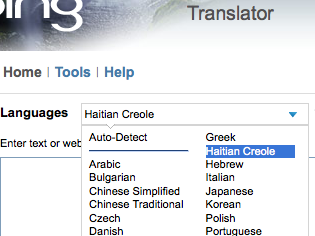 In response to the earthquake in Haiti, Microsoft quickly expanded its machine translation engine to include Haitian Creole. Today I noticed that Google has an alpha version of its Haitian Creole engine as well. Though it’s sad that it took a natural disaster to spur attention to a particular language, I’m glad to see the language available. It’s hard to underestimate the importance of readily accessible machine translation. Just as search engines help us better understand the world, machine translation engines help us better understand one another. And, yes, they’re far from perfect. But they’re far better than nothing at all. And they are finding their way into countless applications and countless fixed and mobile devices, each additional language offering another glimpse into another world.